DEBORAH CROMBIE: I was so inspired by Rosemary's Strawberry Cake last Sunday that I decided to throw in the quintessential English summer desert. And I'd be willing to bet that none of the Reds except Rhys have any idea what an Eton Mess is. Believe me, it tastes much better than it sounds. This no-cook berry pudding was first created sometime in the 1800s at Eton College, one of Britain's most distinguished public schools. It's served with great fanfare every year at the school's June 4 celebration picnic, which is held on the playing fields following a cricket game against the students of neighboring Winchester College. 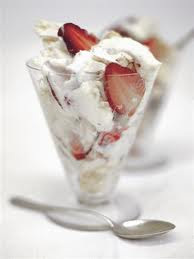 Although historians believe it was first served with bananas, strawberries became de rigueur over the years, as did the addition of crumbled meringue cookies. Think of it as an inside-out pavlova — creamy, crispy, fruity, and sticky. For the five-ingredient recipe, read more. Gently stir together strawberries and granulated sugar in a large bowl. Cover, and let stand at room temperature until juices are released, at least 30 minutes (or refrigerate overnight). Coarsely crush berries using a potato masher. Whisk together cream and confectioners sugar in a large bowl until soft peaks form. Gently fold in cookies and berries (with juices) until almost combined but ribbons of juice remain. Serve immediately. I LOVE this, and I know a lovely pub called The Jolly Gardeners in Putney (London) that does a fab Eton Mess. It should be eaten after a Sunday lunch and a good Pimm's. Give it a whirl, JR readers, and let us know what you think. Happy Sunday! I love Devonshire Cream and was lucky enough to find some in my grocery store. Now that I have it, I can't figure out what it was serve to me with? On fruit? Of course, I could just eat it with a spoon, but so much better to have justification other than just pigging out. Any ideas, Deborah? Would you trade your sanity? And Ginger Did It All Backwards! "There is no frigate like a book..."